TSWRDCET 2019 Telangana Women Residential Degree Admission Online Apply BA BSc B.Com Hall tickets : TSWREIS RDC Degree Entrance Test 2018 Apply Online at tswreisdc.cgg.gov.in. TSWRDC CET 2019 Notification, TSWREIS RDC Degree Entrance test 2019 Apply Online Application form at tswreisdc.cgg.gov.in, TS Lady Degree CET 2019 Admission Process, tswreisrdc cet 2019 Syllabus and Exam Pattern Download. Online applications are invited only from women candidates for TSWDCET-2019 for admission into 1st year B.A/B.Com/B.Sc Degree English Medium Courses in TSW Residential Degree Colleges for Women for the Academic Year 2019-20. How to apply Telangana Mahila degree college entrance test, tswrdc Entrance test 2019 Results, TSWRDC Entrance Test 2019 Marks. TS Womens Degree Cet 2019, Last date for apply online of Tswreis mahila RDC Entrance test 2018 Telangana social welfare RDC admission test 2019 Hall tickets at www.tswreits.telangana.gov.in. 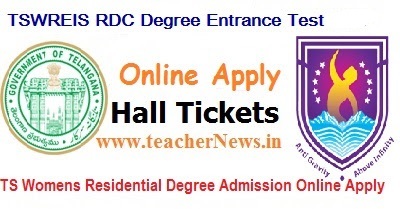 TS residential degree colleges admissions 2019-20 tswrdc cet 2019 merit list and selection list, Tswrdc admission test 2019. TS Women Residential Degree College Admission Test syllabus at tswreis.telangana.gov.in. TSWDCET 2019 entrance test will be conducted in both English media and Telugu media for admission into 1st year under Graduate courses B.A, B.Com, B.Sc Degree English Medium Courses. Each course consists 40 students in TSW Residential Degree Colleges for Women for the Academic Year 2019-2020. Residential College of Life Sciences, Mahendrahills, B.A (HEP) and 6 other courses offered at TSW Residential College of Social Sciences, Ibrahimpatnam, B.Com (Gen), B.Com (Comp) and 5 other courses offered at TSW Residential College of Commerce, Sangareddy. B.Sc (MSCs), B.A (HEP) and 6 other courses offered at TSW Residential College of Social Sciences, Ibrahimpatnam, B.Com (Gen), B.Com (Comp) and 5 other courses offered at TSW Residential College of Commerce, Sangareddy. B.A (HEP) and 6 other courses offered at TSW Residential College of Social Sciences, Ibrahimpatnam. B.Com (Gen), B.Com (Comp) and 5 other courses offered at TSW Residential College of Commerce, Sangareddy. B.Sc (Maths, Physics, Computer Science)4. 1. The candidate shall first go through the information bulletin carefully, available in the website and satisfy herself with the eligibility criteria for appearing for the written test. 2. The candidate after satisfying herself about the eligibility shall pay Rs. 50/- through PAYMENT GATEWAY centres from 27-02-2019 to 26-03-2019 to enable option to submit the application through online. 3. The candidate has to give the required preliminary data i.e., name, date of birth and mobile number at the PAYMENT GATEWAY centre. TSWDCET-2019 will be conducted on 16.04.2019 (Sunday) in one session from 11.30 A.M to 2.00 P.M (2 ½ hours duration) both in English and Telugu media in four subjects. The test will be conducted in TSW Residential Schools/Jr.Colleges located in 31 new Districts basing on the option given by the candidates. For further enquiry, the candidates may contact toll free number 1800 42 54 56 78 during the Office hours (10.30 am to 5.00 pm) on all the working days. TS Women Residential Degree Admission Notification 2019 Apply online at tswreisdc.cgg.gov.in. TSWRDC CET 2019 Syllabus, Exam Pattern, Hall tickets for BA B.Sc Admissions. Will the entrance test be on the intermediate syllabus only? I am really happy with your blog because your article is very unique and powerful for new reader.Can you able to prepare a blog post about womens degree colleges in Hyderabad .So that it's definitely helpful for students like me.